Hurricane proof house plans: Goodbye bunker, Hello gorgeous house! Our preferred construction method for hurricane proof house plans is insulating concrete forms (ICF). The combined strength of solid, poured concrete walls and the steel reinforcements within the concrete provides unmatched structural strength. Once too pricey for many homeowners, ICF construction prices now are nearly the same (and sometimes LESS) than wood-frame construction. In addition, builders trained in ICF construction are more abundant than ever before. An engineer should be used to review and approve any hurricane proof house plans (and it's often required by local building departments). Some of the main areas an engineer will examine is the wall system, roofing system, and windows and doors. In an ICF hurricane proof house, the roof is attached to the walls by the code-required metal strapping (also called tie-downs or hurricane straps). These tie-downs are embedded into the concrete, which provides significant wind protection. Special roofing adhesive is applied to the roof truss sheathing joints and seams, which improves wind resistance and strengthens the roof 2 to 4 times over nails alone. In addition, this adhesive can reduce water intrusion by approximately 99%. The other critical component is the strength of windows. In most coastal areas, impact-resistant windows are required by code. This is a special type of glass that can withstand the impact of flying debris. But in hurricane-prone homes, external shutters made of steel or aluminum provide the greatest protection. Doors need to meet impact-resistant criteria in hurricane-prone areas, too. The Institute for Business & Home Safety recommends outward-opening doors to reduce the potential for water intrusion and to maximize impact resistance. This is where ICF walls really shine. Their ability to resist airborne debris is astonishing. Read more about how concrete walls stood up to wind-driven debris in conditions exceeding 250 mph winds here. You can also view a video of a wall strength test at Texas Tech University here. Watch the following interview with a couple who decided to build an ICF home...the husband is a weatherman! Hurricane proof house plans needn't look like a "bunker"--they can be attractive as well as strong and safe. See the plan below that one of our listed designers created for a site just a few hundred feet from the Gulf of Mexico...in "Hurricane Alley" of Northwest Florida. This is a small house that's big on class and character. It fits well on suburban or urban lots. 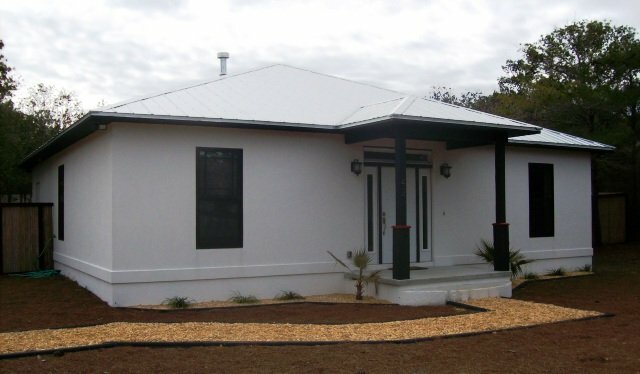 This house is built with our favorite building method, ICF (insulating concrete forms). It is virtually hurricane and tornado resistant, as well as insect resistant. Owners report extremely low utility bills, due to its excellent energy efficiency. It incorporates space-saving features such as pocket doors. or to inquire about their custom design services. 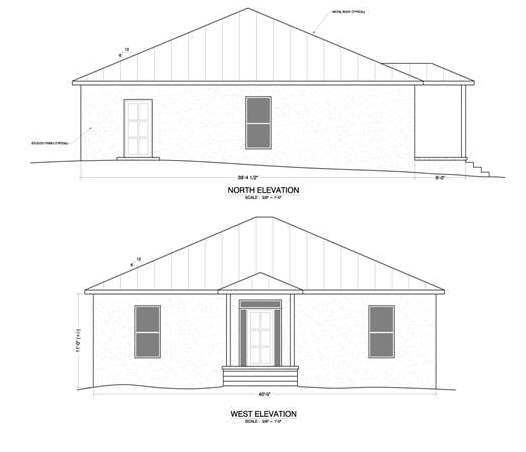 Return from Hurricane Proof House Plans to Concrete House Plans. 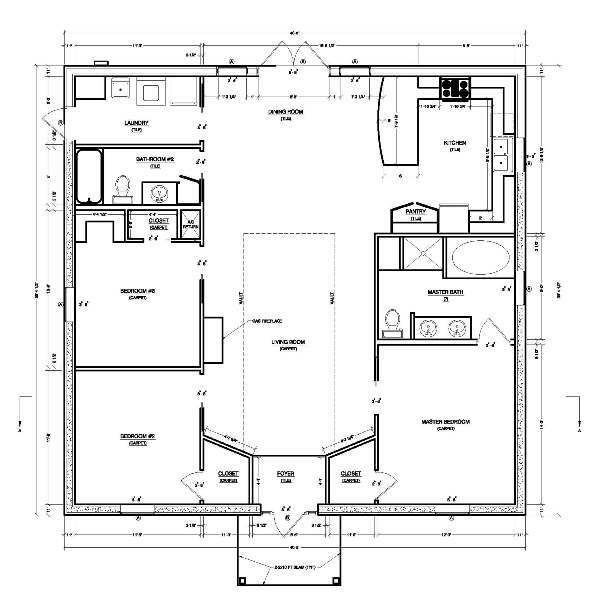 Return from Hurricane Proof House Plans to the Home Page.